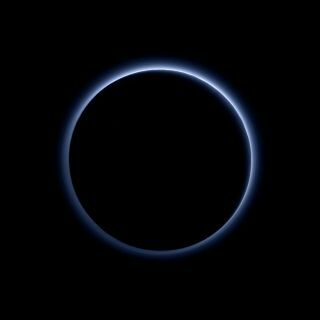 Pluto’s haze layer displays a blue color in this image obtained by the New Horizons spacecraft's Ralph/Multispectral Visible Imaging Camera (MVIC). Image released Oct. 8, 2015. Regions on Pluto having exposed water ice appear in blue in this composite image from New Horizons spacecraft's Ralph instrument, which combines visible imagery from the Multispectral Visible Imaging Camera (MVIC) with infrared spectroscopy from the Linear Etalon Imaging Spectral Array (LEISA). Image released Oct. 8, 2015.